Active shooting incidents are not new and are occurring more frequently. Recent incidents include movie theatres, college campuses, and community centers – but they could happen at any time and anywhere! While you cannot prevent an active shooter incident from happening near your company’s headquarters, you can prepare your team in the event they end up in an active shooter situation at the office or around their neighborhood. What Is An Active Shooter? Active shooters involve one more suspects that are actively killing and/or causing serious, life-threatening bodily injuries to multiple victims. The shooter's objective is mass murder, with no situation containment and high immediate risk of death and injury. 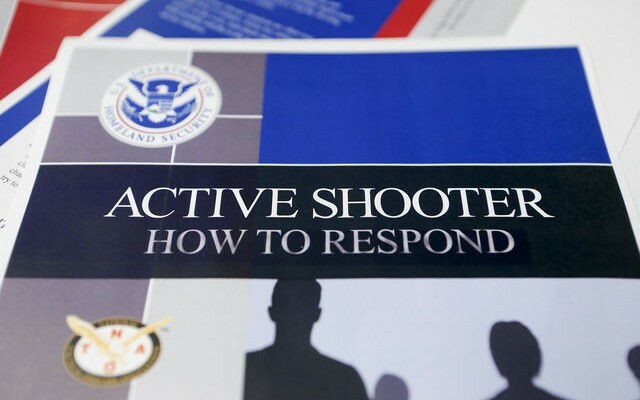 What Do I Do If I Am In An Active Shooter Situation? Active shooters are mentally unstable and have one motivation: to kill. Most active shooters have intended victims and will search them out until stopped by law enforcement, suicide or other intervention. Here are some tips you can use if you’re ever in this situation: • If you are in a room or office with a door, secure the door and stay there. Turn off the lights, silence your phone, and cover any windows. • Have an escape route and plan in mind if you’re going to run. Leave your belongings behind and keep hands visible and raised with spread fingers. • Don’t engage the active shooter. Only fight as a last resort if your life is in imminent danger. Your goal should be to incapacitate the shooter. Being mindful of your surroundings could help you escape quickly if you find yourself in an active shooter situation. When entering a new building, office complex, restaurant, or other establishment, be aware of all nearby exits and what you would do in the event of an emergency. Emplicity’s Safety Team is dedicated to preparing clients and their respective teams for a breadth of situations. We welcome the opportunity to sit with your teams and educate them on emergency preparedness, from active shooter situations, fire drills, and making sure your facility is free from any slip, trip, or fall hazards. If you would like to schedule an appointment, give us a call at: 1-877-476-2339.